Like many Americans, I was genuinely surprised when it was announced yesterday that the Supreme Court of the United States had, by a vote of 5 to 4, upheld in full President Barack Obama’s expansive overhaul of health care coverage. Conventional wisdom had predicted that the Court would likely find the Affordable Care Act, aka Obamacare, un-Constitutional. In particular, it was expected that the individual mandate, requiring that all Americans obtain health coverage or pay a penalty, would be struck down. What was even more surprising was the identity of the deciding, “swing” vote. Expectations had been that if Obamacare was upheld, it would be by a narrow 5 to 4 margin, which indeed was the case. However, it was not Justice Anthony Kennedy who joined the Court’s liberal wing in the decision. Rather, it was the conservative Chief Justice John Roberts. To say that Roberts’ decision was surprising would be an understatement. This is the first time ever since he was appointed to the Supreme Court by George W. Bush in 2006 that Roberts has ever sided with the liberal half in a 5 to 4 decision. There has been much speculation as to Roberts’ motives. A possibility lies in the public perception of the Court by the general public over the past dozen years. Beginning with Bush v. Gore in 2000, and continuing with such high profile, controversial cases as at the Citizens United decision that overturned the McCain-Feingold Act, the Court has made a number of decisions along what appeared to be very political lines. The court has often been split right down the middle between four liberal and four conservative Justices, with the deciding vote often cast by the moderate Kennedy. This has led to many to regard the Court as having become overly politicized, as well as ideologically polarized. Confidence in the Court among many has markedly decreased. It is quite possible that Chief Justice Roberts has looked upon the declining credibility of the Supreme Court, and that this was one of the major motivating factors in his decision to vote to uphold the Affordable Care Act. 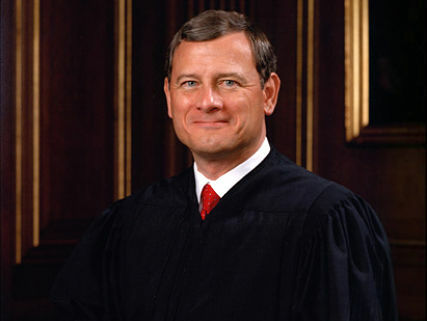 In writing the majority opinion, Roberts solidly framed the Court’s decision solely on its Constitutionality, refusing to make any observations as to the sensibility of the Act, stating “it is not our role to forbid it, or to pass upon its wisdom.” By his actions, Roberts may have been attempting to demonstrate that the Court is still capable of dispassionate analysis of an issue, rendering decisions on purely legal grounds, rather than political considerations. It occurred to me that Roberts may very well have taken this course to preserve the integrity of the Court while, at the same time, privately hoping that in the November elections Mitt Romney and the Republicans will gain control of the White House and Congress, and subsequently overturn Obamacare via legislative means. In other words, perhaps Roberts is attempting to have his cake and eat it too. I certainly don’t want to ascribe any perfidious motives to Roberts’ actions, but it is always difficult to determine what goes through the minds of politicians. I doubt we will ever know the full reasoning behind Roberts’ decision unless some decades from now, retired from the Court, he chooses to write his memoirs. In any case, I really do not want to spend too much time focusing on John Roberts’ motivations. I think it more important to offer up a few thoughts on Obamacare. Right up front, I will admit that the Affordable Care Act is imperfect. There is much about it that can be improved. But, however flawed it is, Obamacare is better than nothing. It promises to offer coverage to millions of Americans who are currently uninsured. We live in one of the richest nations in the world, yet so many of our citizens have absolutely no health coverage, no safety net in the event of a medical emergency. To me, that is unthinkable. Many have argued that the individual mandate is an unfair burden, a massive government intrusion upon personal rights to force someone to either buy medical insurance or pay a fee, just to help total strangers. Well, I have news for you: we already do that for other services. They are known as the police and fire departments. The majority of us in our lives will, hopefully, not be a victim of a crime or have our house catch on fire. But we pay taxes to fund the police and firefighters so that when a crime or a fire does occur, there will be resources to respond to that crisis. It is unthinkable to imagine that only those who can afford to pay for police or fire protection should receive it; that would be the worst kind of selfish Social Darwinism. So then why should our fellow citizens be deprived of an equally important protection, namely health care coverage? Are we really so petty & cruel that we would sit back and watch the poor and unemployed suffer & die from medical conditions that can be treated? For me, access to health insurance has a very personal significance. I was born with a severe medical condition, and had to have open heart surgery when I was one year old. If my parents had not possessed health insurance that covered me, I would probably not have received that life-saving treatment. In addition, in the last ten years I have twice developed cancer, and on both occasions I had to undergo surgery. Each time this occurred when I was unemployed. The first time I was fortunately covered under COBRA, which was continuing my insurance from my previous employment. The second time, I was lucky enough that my parents were able to afford to pay for me to have insurance, albeit at a rather costly monthly premium rate. If on either of those occasions I had not possessed insurance, well, I don’t know what would have happened. And the thing is, I am only 36 years old. I have no idea what other future health problems I might experience. So I am extremely cognizant of just how crucial it is to possess health insurance. Watching as Mitt Romney promises to completely eliminate Obamacare if elected President, I am disgusted. First of all, Romney a hypocrite. As governor of Massachusetts, he signed into law something very similar to the Affordable Care Act, complete with an individual mandate. Sorry, but simply I do not buy his excuse that Massachusetts’ law was one that would only work on a state level, and only for that specific state. It seems to me that the only reason he opposes the Affordable Care Act is because Obama signed it into law. Second, Romney has not offered any alternatives to the Affordable Care Act. On the contrary, he proposes to severely cut Medicaid. Obviously Romney is quite happy to see things remain as they are, to have millions of Americans remain uninsured. For that reason, and many others, I will not be voting for him. 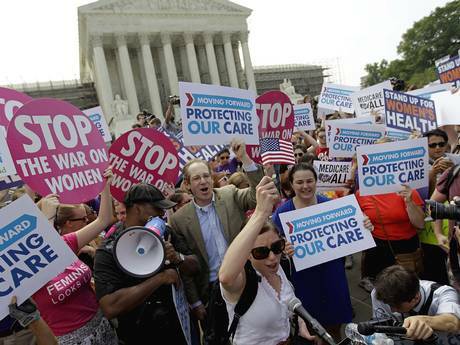 I am very relieved that the Supreme Court upheld the Affordable Care Act. But, at the same time, I am nervous about what will take place in the next several months. I hope that Obamacare did not survive a Constitutional challenge only to be slain by legislative reversal. The comic book biz is one of those fields that, to outside fans, often appears to be a glamorous occupation. But sometimes a case will occur that serves as a reminder that, like any other industry or occupation, it is filled with its share of hardship & tragedy. Such is the case of Robert L. Washington III, who passed away on June 7 at the age of 47. Washington was not an especially prolific writer, and his career in the comic book field was confined to the 1990s. But during that brief time period, he made a significant impact. With co-writer Dwayne McDuffie and artist John Paul Leon, he created Static for Milestone Media, which was published through DC Comics. Washington would write 18 issues of Static. Among his other credits were The Batman Chronicles and Extreme Justice for DC, as well as Ninjak for Valiant Comics. I first became familiar with Static when it was adapted into the very enjoyable animated series Static Shock, which debuted in 2000 and ran for four seasons. Several years later, the first four issues of Static (along with a later miniseries) were collected in a trade paperback, Static Shock: Rebirth of the Cool. I bought that, and found it a great read. It is a real shame that DC did not publish any subsequent volumes. I’ve been meaning for some time to track down the back issues of Static, but it is something I never got around to. 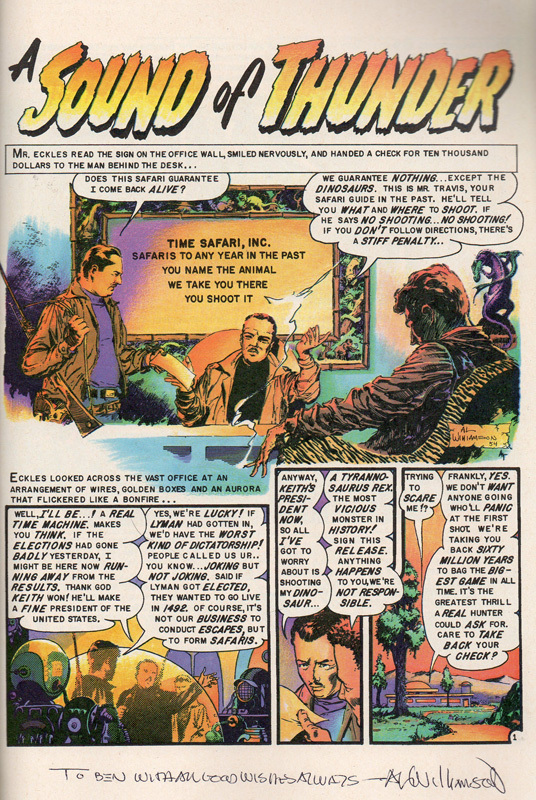 Washington also wrote a two part tale in 1995 for Valiant Comics’ entertaining Timewalker series. Timewalker featured the immortal Ivar Anni-Pada, a millennia-old being who traveled back and forth in time via portals called “time arcs,” having all manner of adventures. Washington’s story “Ashes of the Past” appeared in Timewalker #12-13. Ivar arrives in Tulsa, Oklahoma in 1921, where he attempts to prevent the lynching of an African American teenager who has been accused of assaulting a white woman. In contrast to many of the stories in the Timewalker series, it was a very serious, somber tale. Ivar, despite all his powers, is unable to stop a great tragedy from unfolding. The story by Washington that has really stood out in my mind all these years was an emotional two part Firestorm piece “Storm’s Clearing” that appeared in the DC anthology series Showcase ’96. “Storm’s Clearing” addressed the alcoholism of Ronnie Raymond, as he enters a treatment center to deal with his addiction. It was a very serious and adult look at the problems of substance abuse. The unconventional artwork by Randy DuBurke added to the story’s impact. Years later there were elements to it that I would look back on and identify with when dealing with certain of my own personal problems. Following the severe downturn of the comic book industry in the late-1990s, Washington found himself out of work. According to Comic Book Resources, he was able to obtain employment in such odd jobs as a call center and a warehouse. Tragically, Washington found himself homeless on several occasions, and was forced to rely on financial assistance from the charitable Hero Initiative. Washington was taken to Mount Sinai Hospital in Queens after suffering a heart attack on June 6, and passed away the next day. For me, the story of Robert L. Washington III serves as a cautionary tale of the comic book industry. Despite being a talented writer who had co-created Static, a groundbreaking character who went on to star in a very successful animated series, Washington was reduced to very dire circumstances before passing away at much too young an age. And there just seem to be too many stories like Washington’s, of creators who worked for DC or Marvel or Archie, only to then be left bereft, their creations taken out of their hands, the profits they generated falling into the pockets of corporate owners. In a better, more just & fair world, Washington would still be alive, and writing a new Static Shock series for DC. But that was not to be. After Washington’s death, I could not help but bitterly muse that all too often the mainstream comic book industry has taken its best & brightest creators, chewed them up, and spit them out. Although an extreme example, Washington is just the latest occurrence of a comic book professional falling by the wayside while the corporate machinery of the big companies continues to chug onward. Other individuals wiser than myself have looked at Washington’s unfortunate plight and taken from it the lesson that those who would enter the comic book biz should have a back-up plan, some other career or occupation to fall back on. I certainly hope the young creators of today will take this advice to heart. Perhaps then in the future we will have fewer tragedies such as that which befell Robert L. Washington III. When Doctor Who was revived in 2005 after a lengthy cancellation, that first new series overseen by Russell T Davies was somewhat uneven, as he and his collaborators appeared to be finding their feet. In particular, I was very underwhelmed by the two part story “Aliens of London” / “World War Three,” which felt padded out, and featured the ridiculous monsters known as the Slitheen. However, the show immediately rebounded with the next episode, “Dalek,” written by Robert Shearman. Arriving via the TARDIS in an underground complex, the Doctor and Rose Tyler, played by Christopher Eccleston and Billie Piper, discover a museum of alien artifacts owned by Henry van Statten, a wealthy industrialist portrayed by Corey Johnson. 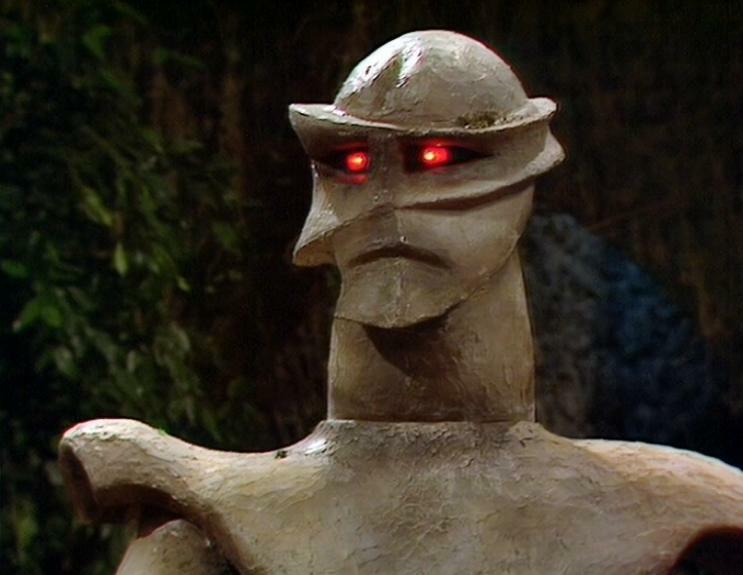 Among van Statten’s collection is one living organism, a creature he has named the “Metaltron.” A horrified Doctor immediately recognizes this being for what it truly is, a member of his oldest, most bitter enemies, the Daleks. Throughout the previous five episodes of Series One, the Doctor has dropped tantalizing hints concerning something called the Time War, a catastrophic conflict that decimated untold worlds across the universe, and left him the sole surviving member of his race, the Time Lords. Now we finally find out who the Time War was fought against: the Daleks. And the Doctor reveals that he was forced to destroy the entire Dalek race in order to bring the apocalyptic bloodshed to an end. 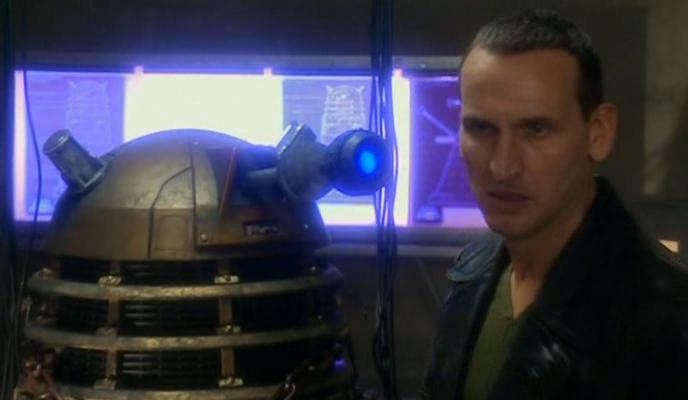 Eccleston is absolutely amazing as the Doctor in “Dalek.” It is startling to watch the Doctor, normally so self-assured, instantly react with such primal fear upon seeing the Dalek in van Statten’s museum. Once the Doctor realizes the Dalek is helpless, this terror is even more shockingly replaced by venomous anger, as the Doctor begins taunting the Dalek for its helplessness and lack of purpose. And then the Doctor actually tries to kill the Dalek in cold blood. As portrayed by Eccleston here, the Doctor is a traumatized, bitter survivor of a horrific conflict, full of rage and sorrow. The Doctor’s anger is not reserved for the Dalek, as he later verbally decimates van Statten for all his hubris and greed. Eccleston’s performance in “Dalek” is extremely powerful, one of the highlights of his year on Doctor Who. I was also impressed with Billie Piper as Rose. This was the first episode where I really saw her as more than just a pretty blonde. Having only recently met the Doctor, she knows nothing about the Daleks. And so she approaches the creature imprisoned by van Statten with sympathy and pity. Later on, even after the Dalek powers up again and becomes a dangerous foe, Rose still keeps an open mind, still believes she can reason with it. And when Rose witnesses just how violent the Doctor is becoming, how he is ready to destroy the Dalek without hesitation, she is the one who talks him down from the moral precipice. Shearman does an excellent job scripting the eponymous Dalek of the story. He totally revitalizes the idea of the Daleks as unstoppable killing machines obsessed with racial purity and the survival of their species. This was probably the best use of the Daleks in a television story since the 1975 serial “Genesis of the Daleks.” At the same time, Shearman remembers that for their tendency to come crashing in, guns blazing, screaming “Exterminate,” the Daleks can also be incredibly crafty, deceitful, manipulative creatures. The Dalek plays upon Rose’s sympathies, playing the helpless victim, getting her to touch its casing so it can use the DNA of a time traveler to revive itself. It reactivates its weapons and goes on a killing spree, cutting through van Statten’s security force, allowing the Doctor to witness the bloodshed on camera, a form of psychological warfare. When the Doctor coldly informs the Dalek that it is the last of its kind, it has no superiors to report to, and starts screaming that if it wants orders then it should go ahead and destroy itself, the Dalek coldly states “You would make a good Dalek.” That leaves the Doctor speechless and horrified. And then the Dalek plays a trump card, getting the Doctor to release it from van Statten’s underground base by threatening to kill Rose. In the end, the Dalek is destroyed not by the Doctor, but by its own programmed prejudices and intolerances. When it absorbed Rose’s DNA, it began to change, to develop the capacity for emotions besides hatred. It is unable to live with itself, and instead chooses destruction. Shearman demonstrates that the Daleks, for all their power, are ultimately an evolutionary dead end. They already believe themselves the superior life form in the universe, they refuse to accept the necessity of evolving, and they completely reject anything that is different, including among themselves. This is a theme the revival of Doctor Who would continue to explore in subsequent stories, as the Daleks repeatedly thwarted any efforts to change, even if doing so meant their own destruction. Nicholas Briggs does a superb job voicing the Dalek, imbuing it with a gamut of emotions. Early on, when it is being deceitful, you really are left wondering just how much of what the Dalek is saying is truth, and how much manipulation. At the end, when the Dalek realizes that it is changing, Briggs gives the creature a very palpable sense of confusion and sorrow. His performance really drives home the tragedy of the Dalek’s demise, that this being on the cusp of becoming something greater, and better, instead chooses suicide. I would not say that “Dalek” is a completely flawless production, though. I had a very difficult time wrapping my head around the notion that Henry van Statten was so rich & powerful that he owned the entire Internet and had the ability to decide who would become the next President of the United States. The character is just written as too flippant and silly most of the time. It would have been better to simply characterize him as an extremely rich, ruthless businessman, and in the process tone down a bit of the comedy. “Dalek” introduces the character of Adam Mitchell, played by Bruno Langley, who became a very short-lived traveling companion with the Doctor and Rose. So short-lived, in fact, that he was dumped back on Earth at the end of the very next episode, ‘The Long Game.” I felt that was a shame, as he was well-written here, and had the potential to become a good recurring character. I guess that the chemistry I thought could develop between Rose and Adam would eventually occur several years later with the characters of Amelia Pond and Rory Williams when Steven Moffat took over as head writer on Doctor Who. By the way, this is a minor complaint, but the story title “Dalek” is just rather, well, bland. I thought a better one would have been “The Survivors,” which would be been a reference to both the Dalek and the Doctor. And it would have been a clever nod both to the second episode of the original 1963 serial to feature the Daleks written by Terry Nation, as well as to his post-apocalyptic 1975 drama. In any case, besides a few minor flaws, “Dalek” is one of the strongest episodes of Christopher Eccleston’s year on Doctor Who. I rank it alongside “Father’s Day” and the two part “The Empty Child” / “The Doctor Dances” as the high points of Series One. I never thought I’d see the day when I would decide to drop Captain America from my monthly comic book reading list. As I’ve said before, I am a huge fan of the character, and I have not missed an issue of the series since 1989. But I have just gotten weary of Ed Brubaker’s decompressed writing on the main series. The second Captain America ongoing book has the original numbering but now features a rotating co-star each story arc. I believe that, to tie in with the Avengers movie, Marvel is going through the team membership. Hawkeye was featured in issue #s 629-632, and Iron Man comes on-board next month. Unfortunately, I’ve likewise been underwhelmed by the last few issues of this title. There are also financial considerations at play here. Right now I can’t really afford to purchase too many comic books. I would much rather save my funds for Erik Larsen’s Savage Dragon and Supreme, and a few other independent titles that I’m enjoying more than the majority of the material from Marvel or DC. Anyway, what exactly did I think of Captain America & Hawkeye #s 629-632? Well, to be fair, this four issue arc written by Cullen Bunn did have a lot of potential. Cap and Hawkeye are in the San Andreas Mountains, searching for a missing group of environmental activists. The two Avengers come across a government research facility named Damocles which is acting in an extremely secretive manner. Despite a hostile reception from Damocles, Cap and Hawkeye continue their search in the caves underneath the base. There they encounter an army of reanimated dinosaur skeletons, brought back to life by an insidious parasitic life form, one that is seeking to expand its control to living human beings. Bunn is drawing on some near-forgotten subplots here, specifically material written by Chris Claremont and Bill Mantlo in the early 1980s. Bunn does put it to good use, though, giving those decades-old storylines from Ms. Marvel and ROM Spaceknight an interesting twist. As a fan of the books those plot strands were originally featured in, I enjoyed seeing something unique being done with them. If you’re going to recycle the past, you ought to put a unique spin on things. The problem with Captain America & Hawkeye is in the execution. 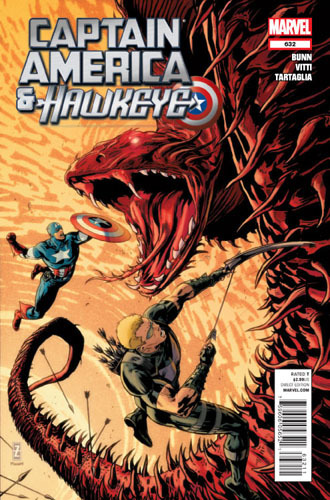 We basically get four issues of Cap and Hawkeye fighting Dire Wraith-dinosaur hybrids. The story feels extremely decompressed. It could easily have been told in the space of three issues, rather than four. Conversely, at the exact same time, the readers are given no answers as to the mysteries of what Damocles is really up to, and the identity of their mysterious benefactor. Some of the space that Bunn devoted to the Avengers / dinosaurs slugfests could instead have been utilized to explain what was going on behind the scenes. Perhaps Bunn is intending to develop this further in upcoming issues of this title. I would not have minded that as much if, again, this opening arc of his had been more tightly plotted. This is the major problem a lot of writers have when it comes to writing for the trade paperback, in that they just do not have enough material to their stories to fill up the space. I don’t mean to say that this story arc was bad. There was a lot to it that was fun & entertaining. It just needed some serious tightening up in the plotting department. I did enjoy the artwork by Alessandro Vitti. Admittedly it was at times somewhat unclear as to what was taking place in some of the action sequences. But Vitti’s style was extremely well suited to the horror content of the story. In an arc like this, it makes sense to not have Cap or Hawkeye look too clean-cut, to make them slightly more shadowy & gritty. And I was especially struck by Vitti’s renditions of the dinosaur parasites spawned from the shape-shifting Dire Wraiths. It really captured the gruesome, alien quality of the original Wraiths seen in the pages of ROM Spaceknight. Captain America & Hawkeye #629 features a beautifully painted cover by Gabriele Del’Otto, while for the next three issues the cover art is from the talented, underrated Patrick Zircher. I’ve enjoyed his work since his days penciling New Warriors. Right now, I still haven’t decided if I am going to pick up Captain America & Iron Man. It really depends on what else happens to be on sale a month from now and, more importantly, how much money I have in my wallet at that time. It’s strange, because for a long time I thought Captain America would be the very last comic book series I would ever stop reading. But times change, and so do people, and I guess I’m just more interested in other material right now at this point in my life. 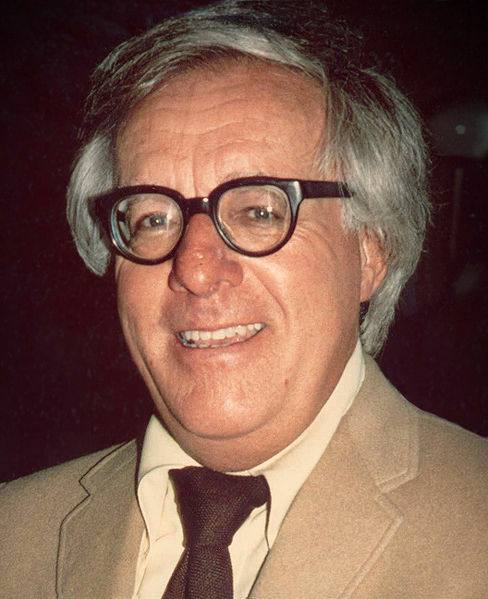 I was sad to learn of science fiction author Ray Bradbury’s death on June 5th at the age of 91. In my youth, I read a number of his stories. His short story collections The Illustrated Man and The Martian Chronicles are both in my personal library, and I discovered numerous others of his tales in various sci-fi anthology books. In addition, I frequently watched The Ray Bradbury Theater, which adapted his short stories for television. And I enjoyed reprints of the EC Comics’ adaptations of his writings which were featured in the pages of their famed science fiction and horror titles. 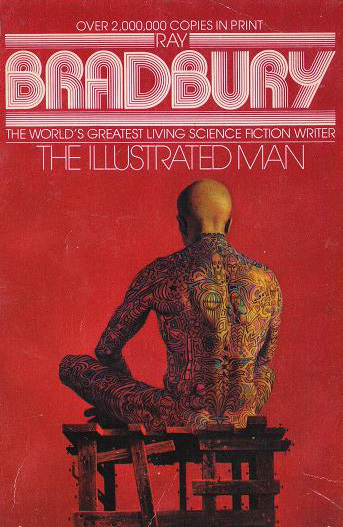 What really made Bradbury’s work stand out for me was that he so deftly blended science fiction with horror. In his stories, the wonders of the infinite universe stood side-by-side with the darkest of primal terrors. Bradbury’s prose could be incredibly poetic. Yet, at the same time, there was a certain disquiet to his writing. The forlorn searching of the sea serpent for another of its kind in “The Fog Horn,” the cruelty that children can exhibit towards one another in “All Summer in a Day,” the descent of the human mind into madness in “The Long Rain;” the stories of Bradbury were often imbued with a sense of palpable anxiety. It was my introduction to what I now recognize as the Butterfly Effect, in this case quite literally. And the ending was unremittingly bleak. “The Veldt” was written in 1950, and in retrospect is probably one of the first short stories to postulate virtual reality. Bradbury sees this technological development not as a positive one, but something with effects akin to an addictive drug, complete with isolation from the rest of humanity. This is demonstrated through Peter and Wendy, two children who spend all of their time within their telepathic “nursery,” to the exclusion of all else. The ending is, once again, an especially grim one. One of the most frightening stories I read when I was younger had to be “Mars is Heaven” (re-titled “The Third Expedition” in The Martian Chronicles). An expedition to Mars arrives on the Red Planet to find what appears to be a pastoral early-20th Century small town populated by the deceased relatives of the rocket ship crew. The astronauts are quickly pulled in by this seeming paradise. But obviously all is not as it appears. Bradbury effectively ratchets up the suspense as the story progresses. It climaxes in something horrible happening to the crew, and Bradbury leaves it ambiguous exactly what has taken place. He must have realized that the unknown is often much more terrifying than what we do see. Certainly my young mind filled in all sorts of nightmarish possibilities trying to figure out what horrific fate had befallen the astronauts. Not a stand-alone story as such was the framing device for The Illustrated Man collection. I found it especially effective, the concept that a man had been covered from neck to toe in mystical tattoos, and that the lines of ink come alive to reveal events of the past, present and future, of our world and many others. It was an interesting method of linking together the disparate short stories collected in the volume. And in the denouement of the collection, Bradbury returns to the tattooed man and the narrator, offering a chilling moment of disquiet. Despite his recent illness, Bradbury was active as a writer up until the end. He contributed an essay, “Take Me Home,” to the recent science fiction themed issue of The New Yorker, which was topped off by a charming cover illustrated by Daniel Clowes. In his essay, Bradbury reflects on his childhood, and the influences that led him to write some of his stories. An idyllic piece, it was a lovely way to cap off a brilliant career that spanned seven decades. It is certainly a fitting tribute to the man and his work. I’ve decided it’ll be fun to do some random reviews of Doctor Who stories. 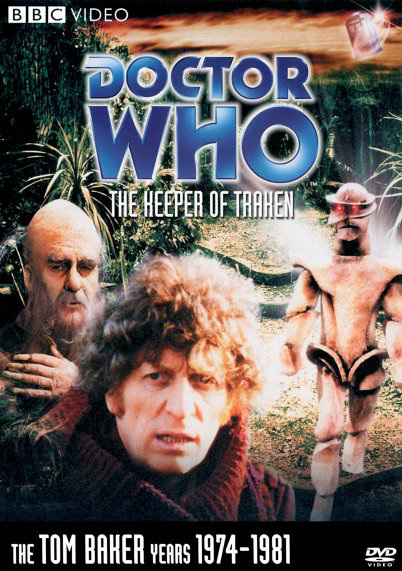 First up is “The Keeper of Traken,” which originally broadcast on the BBC in early 1981. I must have first seen “The Keeper of Traken” around 1984 or so, when I was eight years old. Doctor Who was showing Monday to Friday on the local PBS station, WLIW Channel 21, and I had only really started watching the series a few weeks before. So “The Keeper of Traken” was maybe the seventh or eighth Doctor Who story that I ever watched. I don’t know if I’ve ever had a chance to watch it in its entirety since then, until I recently purchased the DVD. It was interesting to see what a difference 28 years can bring to your perspective, as well as how different things seem when you are a long-time Doctor Who fan, as opposed to a complete newcomer to the show. In “The Keeper of Traken,” the Doctor and Adric arrive at the Traken Union, a series of planets that have existed in peace & harmony for millennia due to the bioelectric Source. The Union is one of the most peaceful groups of worlds in the entire universe. It is so peaceful, in fact, that normally beings of evil intent who visit it are instantly calcified. Such is the case with the mysterious Melkur, who arrived on Traken years before seeking to steal the Source, but instead was transformed into an unmoving statue. The Doctor and Adric have been brought to Traken by the Keeper, a being of immense cosmic power who is nearing the end of his thousand-year existence. Knowing his death is coming soon, and sensing a terrible evil approaching that he is now powerless to stop, the Keeper hopes that the Doctor will be able to save Traken from its impending peril. I will admit, when I first saw “The Keeper of Traken” nearly three decades ago, I was quite underwhelmed. There seemed to be an awful lot of talking about scientific principles that went completely over my head. When there was some action, it was the Doctor and Adric, who are falsely accused of being agents of the Melkur, getting captured, escaping, running around, re-captured, etc. The story really did not get interesting for me until towards the end of episode three. The mysterious figure controlling the Melkur statue was revealed as this sinister hooded figure of death, and the Melkur succeeded in taking over control of the Source by becoming the next Keeper. What a cliffhanger! I had no clue who this hideous-looking being was, or how the Melkur could just disappear and reappear like that. After all, I had never heard of the Master. Neither, until this point in time, did I realized that the Doctor was not the only person with a TARDIS. But I was very interested in what was going on. So even though I still didn’t really understand much of what took place in the fourth episode, I definitely enjoyed it. Actually, I thought the Master was such a cool, evil bad guy that I couldn’t understand why at the end of “The Keeper of Traken” he turned into a relatively normal-looking, albeit quite sinister, man with a pointed beard. It was probably at least a couple of years before I had an opportunity to see “Terror of the Autons” and I realized that was pretty much how the Master had normally looked before he had come to his final regeneration. In any case, re-watching the entire serial of “The Keeper of Traken” in 2012, I enjoyed it a lot more. There was a crucial aspect of the story that totally went over my head all those years ago that I now caught upon, and I realized just what a tragic story it is. On the night of his wedding to Kassia, the Traken consul Tremas is named by the Keeper as his successor. All at the wedding party, Kassia included, know that the current Keeper will soon die. And so Kassia’s moment of happiness is immediately dashed against the rocks, and she realized that her new husband will very soon be taken from her. It is this devastating fact that causes this normally virtuous woman to turn to the Melkur for help, to save her husband from becoming the next Keeper. And that initiates the entire chain of events that leads to so many deaths, including her own horrible demise. Another element of the story that was new to me was one I feel really did not come through in the final transmitted serial. Writer Johnny Byrne (no relation to the comic book creator) was inspired by the upcoming Millennium which he explained in the extra features on the DVD. He reflected that here on Earth, every thousand years humanity experienced tremendous social, political & religious upheaval. That inspired Byrne to create Traken, a world which for the thousand year reign of each Keeper would exist in tranquility, but at the end of which everything would start to go to hell in a hand basket. Viewing the serial again after watching the “making of” documentary and listening to the audio commentary, it suddenly made much more sense why everyone on this supposed paradise was acting so violent, fearful and corrupt. As I said, this really isn’t sufficiently communicated within the actual television program, but I put that down to budget restrictions, as we only see a tiny part of the Traken world, and only meet a few of its citizens. Script editor Christopher H. Bidmead should probably be considered the uncredited co-writer of “The Keeper of Traken.” As explained on the “making of” extra, Byrne wrote the first draft of the story and went away on vacation. At this point in time Bidmead made significant alterations to the scripts. This included, at the behest of producer John Nathan-Turner, replacing the original villain, a being called Mogen, with the Master. On his return, Byrne then worked on the final drafts. Certainly all of the scientific & mathematical elements of the story appear to have sprung from Bidmead, who famously sought to bring a much more “hard science” approach to the show. As I’ve said before, I had difficulty comprehending some of these ideas. What I will say in Bidmead’s favor is that, despite this, everything does come across as possessing an air of legitimacy and accuracy. I am thinking about this in direct contrast to something like Star Trek: The Next Generation, where the scripts sometimes drowned in techno-babble, and it often seemed obvious to me that they were making stuff up to get to a quick resolution. In contrast, Bidmead’s use of scientific principles is presented with a definite conviction, so that even if the viewer does not fully understand what is taking place, it appears to have the weight of authenticity to carry it. The acting on “The Keeper of Traken” is typically top-notch. Nathan-Turner wanted Tom Baker to significantly turn down the humor of his performance of the Doctor during Season Eighteen. While Baker was reportedly unhappy with this, it did lead to a more subdued, somber Doctor who nevertheless still possesses a definite mischievous quality about him, actually bringing him back in line with his first few seasons on the series. That is definitely the case with Baker on this story, in that he is a rather serious figure, but definitely still possesses his unique sense of humor. Over the years, Matthew Waterhouse as Adric had been much maligned by many fans. I really think a lot of this has to do with the quality of the scripting he was given the year after this one, when the role of the Doctor was taken over by Peter Davison, and it was decided to make their relationship much more contentious. Here, with Adric spending a lot of time paired up with the Fourth Doctor, the character is perfectly fine. Baker and Waterhouse have a nice rapport, and Waterhouse does a good job at making the character work. I realize that if Waterhouse had been given the opportunity to develop a similar relationship with Davison, instead of Adric being written as whiny & petulant, then he might have continued to be a successful character. “The Keeper of Traken” also introduces Sarah Sutton as Nyssa, although she did not become a regular character until episode two of the next story, “Logopolis.” It is a nice debut for the Sutton, and she does a good job. I’d have to say that Nyssa’s introduction is one of the character’s strongest stories. Like Adric, I don’t know if she was as well served by the writing the year afterwards. But you can definitely see that there was a lot of potential to the character here, and Sutton really brings it out. And then we come to Anthony Ainley as Tremas. It is really weird watching Ainley here, because at the end of “The Keeper of Traken” the Master uses the power of the Source to take over Tremas’ body, and from that point on Ainley played the Master, usually as a very over-the-top, scenery-chewing supervillain. So seeing Ainley as Tremas was an interesting contrast, because he is the complete opposite of the Master, a benevolent, kindly figure who loves his wife & daughter and enjoys discussing scientific discoveries with the Doctor. Ainley turns in a low-key, subtle performance, and it really shows that he was capable of playing more than just sneering bad guys. It is a shame that Ainley was never allowed to bring any of that depth to his portrayal of the Master until his final outing in “Survival” eight years later. In any case, Ainley’s nuanced performance as Tremas really drives home just how much of a tragedy it is when the Master murders him to gain a new lease on life. 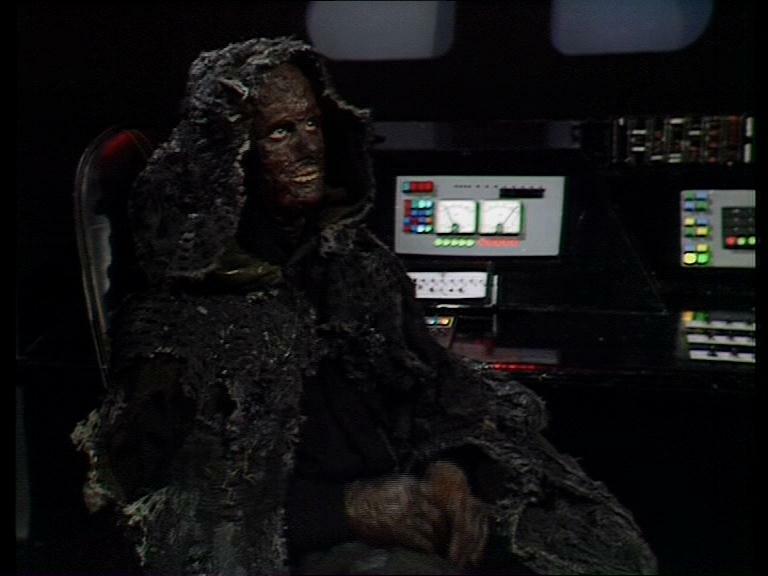 Speaking of the Master, Geoffrey Beevers does a superb job portraying the renegade Time Lord in his corpse-like state. It is a mostly vocal performance, for much of the time the Master is hidden within the seemingly-inanimate Melkur statue (actually the Master’s TARDIS). When the Master is finally revealed, Beevers is acting behind heavy make-up. But he totally makes the performance work. Watching “The Keeper of Traken,” I was reminded of Bidmead’s description elsewhere of the Master as “the devil incarnate.” The thing about the original Master, as played by Roger Delgado, was that, yes, he was a murderous sociopath. But he could also be charming and charismatic when he needed to be. And here he really is the metaphorical serpent in paradise, gradually luring Kassia from the path of righteousness, until she finds she is in way over her head, at which point the Master reveals his true, malevolent side. Subsequently, when the Melkur first becomes the new Keeper, the Master acts in a very pleasant, reasonable manner, because his access to the Source is not yet solidified, and he needs to put everyone off-guard with his charm and false humility. But once he is fully entrenched in his new position, he lets his true colors show, becoming a sadistic, cackling fiend. Beevers’ delivery of his lines is wonderfully seductive and diabolical, and he totally succeeds in making the Master a memorable arch-foe. As I mentioned earlier, even as an eight year old, I thought Beevers’ rendition of the Master was superb, and there was that disappointment when Ainley took over the role. I understand why the Master was revitalized and given a human appearance once again, as there is only so much you can do with the character as a walking corpse. Nevertheless, I always thought it would have been nice to have Beevers reprise the role. So it’s been a pleasure to have him return to playing the Master in several of the Doctor Who audio adventures from Big Finish, where he’s definitely recaptured the sly, mocking villainy of the character to excellent effect. I will admit, I do not know if “The Keeper of Traken” would be as memorable a production if it was not for the inclusion of the Master. That said, it is definitely an above average entry in the Doctor Who canon. In addition to the strong acting, there is a lot going for it. The set and costume design are rich and vibrant. Roger Limb’s musical score is very effective. And the direction by John Black is solid. All in all, the serial is of a pretty high quality. Perhaps if more of Byrne’s ideas for exploring the upheavals brought on by the Millennium would have made it to the screen, it would have been an even stronger story. Nevertheless, in most places it works very well. One last item about the DVD. Ainley, who passed away in 2004, apparently was not especially fond of publicity. I don’t believe he was a recluse, because he made a number of appearances at Doctor Who conventions. But for whatever reason, he was reluctant to give many interviews or participate in any DVD “making of” features or audio commentaries. The commentary on “The Keeper of Traken” is, as far as I know, the only DVD extra he contributed to before he passed away. Byrne, who is also on the commentary, does a good job at engaging Ainley, getting his thoughts on various aspects of the production. It’s definitely worth listening to for Ainley’s thoughts on the story, as well as his portrayal of the Master in general. Ainley was quite informative, and sounded like he had an enjoyable time recording the commentary, so it’s a shame he did not participate in any other DVD extras.